The jobs market is a barometer to the health of the economy. Other than interest rate announcements from the Federal Reserve there are few pieces of economic data that will move markets as much as employment data. In this article, I’ll explain some of the regular US jobs reports and how they can impact the US Dollar as well as other currencies. We categorize jobs data as measuring either job creation, job turnover or job participation. Each of the reports highlights certain aspects of this and together give a full picture of the status of employment. Above all else, the markets are interested in newly created jobs because this indicates a growing economy. ADP is a research institute that publishes national employment figures. The ADP national employment report usually comes out a day or two before the official nonfarm payrolls data from the Labor Department. One thing to note is that the ADP report only includes jobs in the private sector. It does not include government jobs. Only new hirings by private firms. The report breakdown is by sector, by company size and by industry. As shown in Figure 1 below, the number reported by ADP correlates reasonably closely with that of the official nonfarm payrolls. 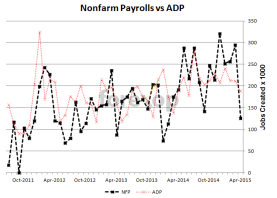 The ADP report is therefore one to watch as a leading indicator before the official NFP release. 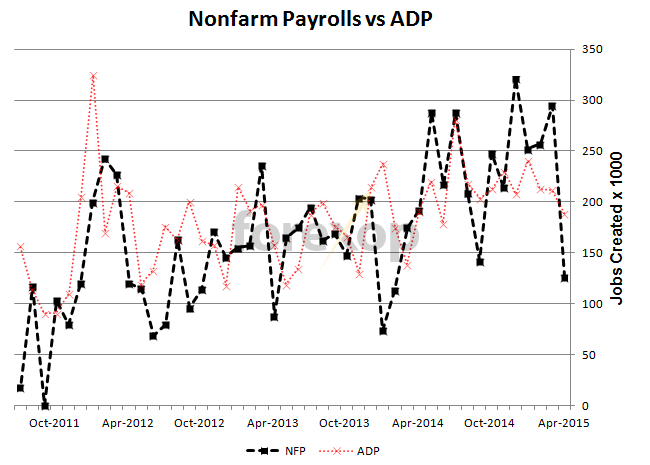 Large variations either way in the ADP jobs figures often show up later in the NFP release. Even so the NFP does tend to see a much bigger reaction in the markets. Why is this data important? Initial claims give a “heads up” as to what’s going on in the labor market. Rising claims suggests that jobs are being lost and people are not moving directly into new employment, hence the need for state support. The data does tend to be “noisy” for a number of reasons. Firstly because it is reported weekly it can be skewed by events such as public holidays and other circumstances. This is why it is important to read any notes about “special factors” impacting the week’s claims. While the headline number is important, the moving average gives a much better idea of the overall trend in the jobless claims. Again, the trend is important so take note of the 4-week moving average. The number of openings gives the number of vacancies and any significant changes across industries. The number of hires is the number of vacancies which were actually filled. Again any significant variation across industries or regions is usually noted. Finally the number of separations gives the number of jobs that terminated. A useful element of this is the number of voluntary quittings. A rise in voluntary quitting is a sign of a healthy labor market as it indicates employees are confident enough to move between jobs. The Federal Reserve watches this number among others as a sign of a thriving jobs market. After FOMC meetings, the nonfarm payrolls report is one of the biggest events in most traders’ diaries. Why is the nonfarm payrolls report so crucial? The simple answer is that the Federal Reserve watches this data very closely when deciding changes in monetary policy. As we’ve shown here there is a close relationship between the nonfarm payrolls number and changes in US Dollar interest rates. Fuller employment leads to rises in wages, and boosting demand and rising inflation. Signs of a growing economy. Consequently the nonfarm payrolls report can be both highly positive or negative for the US Dollar. Anything that is positive for the US Dollar tends to draw funds away from other currencies and therefore is a negative for those currencies. This is why for example you’ll often see other crosses impacted after a surprise in the nonfarm payrolls as funds pull away (or draw towards on a negative surprise) from riskier currencies. So what does this report actually cover? The headline number gives the number of newly created jobs across the country. It does not include jobs in the farming sector because these tend to be highly volatile and seasonal. Headline numbers above 200k tend to be bullish for the US Dollar especially when the figure exceeds expectations. In a growing economy, the US typically adds around 120k to 150k jobs each month. The dollar will react instantly to the headline figure. As with other employment data, the trend in the numbers is what really matters. Sharply slowing jobs growth often foretells of a slowdown in the economy. While the reverse indicates an economy on the up. The relation between the ADP and non-farm is very useful – consider that the former does comes out beforehand. ….and useful to know about the quitting data which can be found in the other report.